While at the farmers’ market the other day, we ended up picking up some Red Swiss Chard. The color was so bright and vibrant that we were immediately drawn to it. In truth, we had never prepared it before–nor did we know what we were going to do with it. But, when at the farmers’ market, pick up what’s fresh. 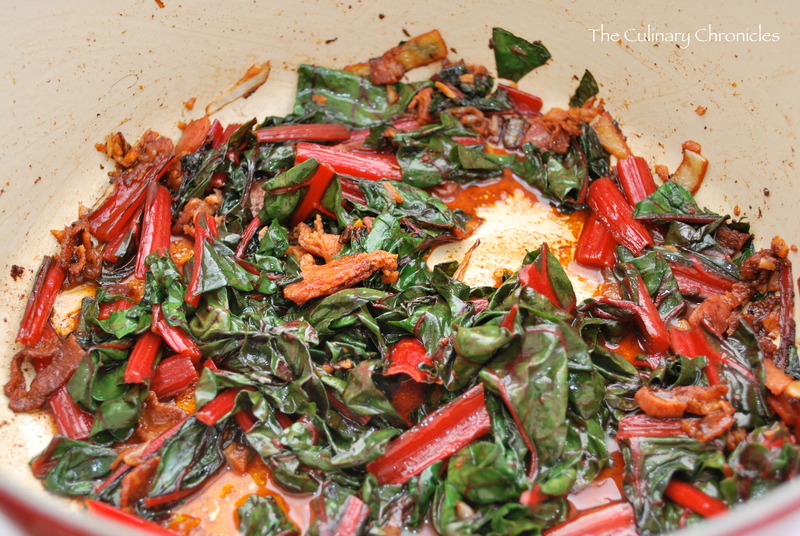 Since the Chard is of the dark greens genre, we figured a low, slow saute with bacon would be a great preparation. And well, I’m always trying to find ways to add bacon into things. As for the main dish, we settled on roasting a Cornish Game for an earthy, and somewhat rustic feel. Plus, Game Hen is perfect when prepping dinner for two. MUCH faster than roasting an entire chicken and the perfect serving size. Our end result was absolutely delicious! HEARTY, savory, and just darn belly warming. We plated the hen with toasted pieces of bread underneath to soak up all juices. Waste not, want not! 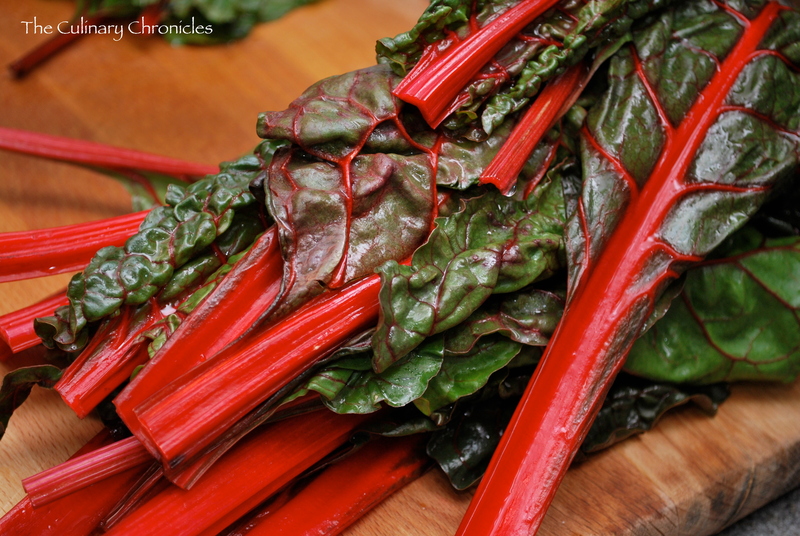 And as for the Chard—stunning! Slightly bitter yet much more tender than I expected. Of course, the bacon added a wonderful smokey taste but didn’t overpower the natural flavors of the greens. This is DEFINITELY being added to my veggies repertoire. Have any other suggestions to pair Swiss Chard with? Leave me a comment as I’m always looking for some delish suggestions! 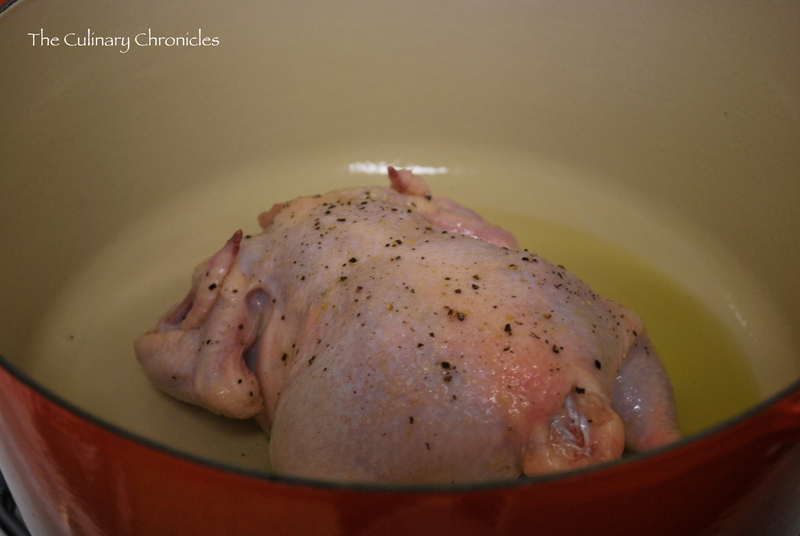 Take Hen and slide hand between skin and breast meat to loosen skin. Rub 2 tablespoons Butter underneath skin. Inside the cavity, heavily salt and pepper the hen. Stuff the cavity with the remaining Butter, Yellow Onion, Garlic, and Bouquet Garni. Rub the exterior of the Hen with Olive Oil and Salt & Pepper the Hen. Tie the legs loosely together with kitchen twine. In a dutch oven heated on medium high, add 2 tablespoons of olive oil. Place the Hen in the dutch oven, breast side down. Sear until golden brown—approximately 4-5 minutes. Flip Hen so that the breast faces upwards. Cover the dutch oven and place in the oven. After 25 minutes, remove lid. Roast Hen until thermometer inserted into thickest part of thigh registers 170 degrees. Carefully remove from dutch oven and rest on cutting board. Cover and loosely tent with aluminum foil. Move dutch oven to the range and turn flame to medium. 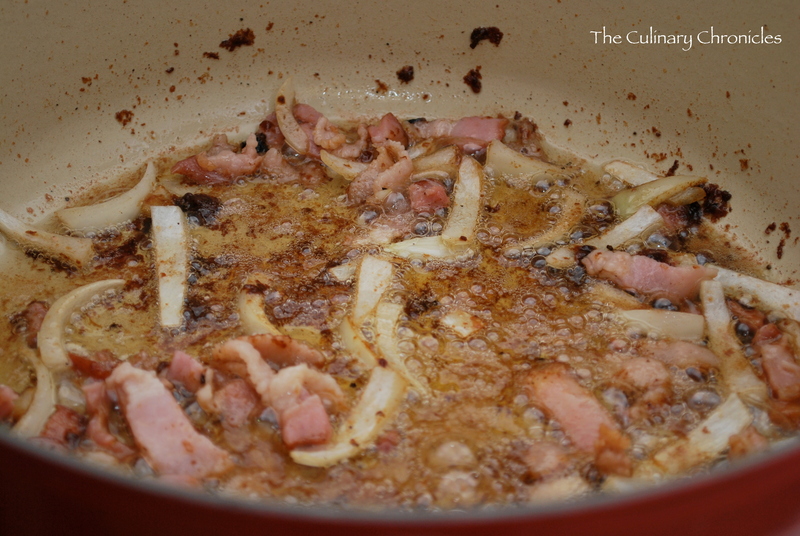 Carefully add sliced Yellow Onion and chopped Bacon. Cook until Bacon is barely crispy. Add Garlic and cook for 1 minute. Add stems of Swiss Chard and stir. Cover and continue to cook for 3 minutes. Remove lid and add leaves of Swiss Chard. Sauté for an additional 3-4 minutes or until Chard is tender. Remove from heat and stir in Vinegar. Salt and Pepper to taste. To plate, place Swiss Chard on dish. 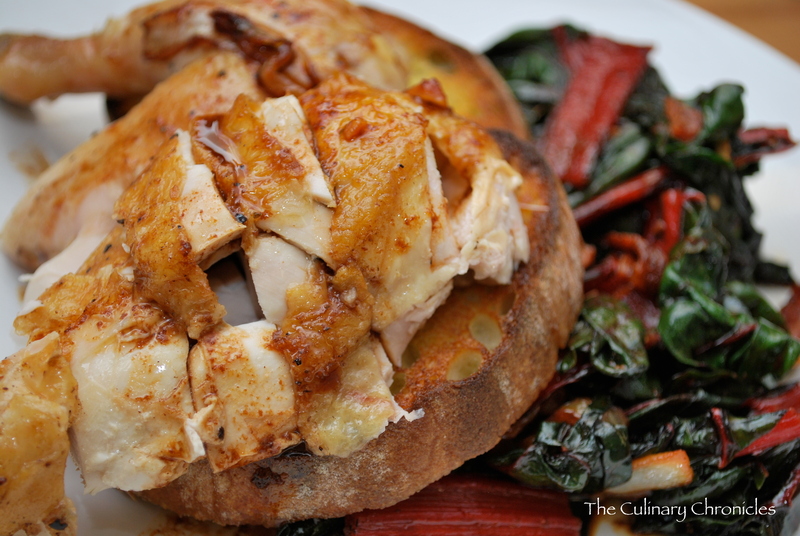 Place two pieces of toasted bread on top of Chard. Proceed to place Hen on top of toast. Spoon any remaining juices from the Swiss Chard dutch oven over the chicken. Damn, girl. You are getting serious. I love that you have recipes and beautiful colorful photos now. Love it. What next? A restaurant? What happened to wedding planning?